Do you ever feel like you tend to gravitate towards the same types of meals day after day and week after week? I know I do. It seems we tend to have a lot of Mexican – specifically tacos or burritos and Asian food. I’ve really been wanting to try something new and different. The strange thing is we love trying new foods but too often tend to still fall back on a certain type of meal. A few weeks ago we had made a stop at Trader Joe’s and I had bought some barley. I’ve tasted it before – you know in the canned vegetable soup – but never cooked with it. For some reason I have a hard time finding here in the city where we live. So, I decided to do something with it. While browsing for some recipe inspiration I happened upon this recipe for Beef And Barley on the Food Network Website. I will be honest I really didn’t change it up much. As I mentioned before I haven’t cooked with Barley before and I didn’t want to push my luck. It turned out pretty good. Even Robbie liked it. He’s a little funny sometimes when it comes to new things but yet he loves things that most kids wouldn’t touch like muscles, squid and frog legs! Go figure! This is a great recipe for cold days and it’s very filling. The thing is it’s finally been warm here! Up to 83 degrees warm. I think that’s why I didn’t eat as much as I may have normally. 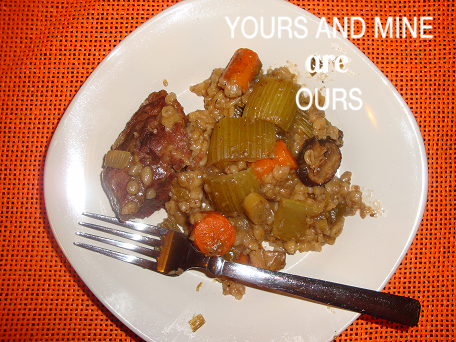 The flavor was great though and I really enjoyed the barley with the vegetables. The original recipe called for cooking 8 to 8.5 hours on low and I will tell you that’s much too long. I have adjusted the recipe to 6.5 hours. What are your families go to meals? Do you get stuck in ruts too? Dissolve bouillon cubes in 4 cups of water and set aside. Combine all ingredients in crockpot beginning with beef. Pour beef the 4 cups of beef broth over all. Do not stir. Cook on low for 6.5 hours. Uncover and skim fat off. Remove beef to a dish and cut into bite size pieces. 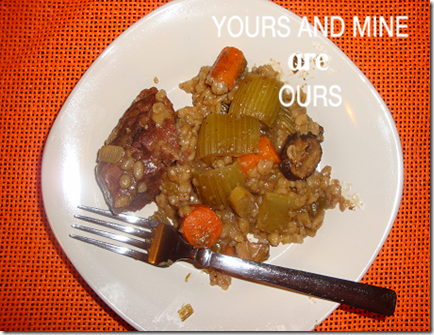 Serve with barley & vegetable mixture. *Note* If you prefer to have a more liquid dish you can add water to the barley & vegetables. Beef and barley sounds super delicious, Tammy!